Safe, quality water for you and your family or place of business on Nova Scotia's South Shore! Water should be crystal clear - without odor or unpleasant taste. Many common problems can cause your water to become cloudy; have a bad smell and off-colour. Langille's Plumbing & Heating can design and deliver solutions for any water treatment problem. Bring us a water sample and we will test it ourselves or send it to an independent lab for complete analysis. Based on the results, we will develop a system to meet your individual needs. 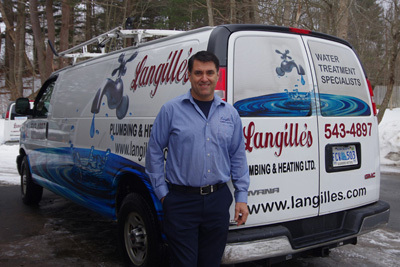 Paul Langille, owner of Langille's Plumbing & Heating in Bridgewater Nova Scotia has been in the business since 1980. Municipal water supplies usually add chlorine to de-contaminate their water. The presence of chlorine in water can not only cause a bad taste and smell, it can dehydrate skin and hair. 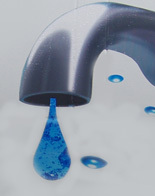 Many different contaminants can enter your water and cause varying levels of cloudiness. Microorganisms and other bacteria can thrive in moist, dark environments and end up in water fixtures. Water hardness is derived from calcium and magnesium minerals dissolved into water beneath the earth's surface. These minerals cause soap scum and water spots on fixtures. Iron and Manganese as well as other metals in a water supply can create a metallic taste and odor. An unpleasant smell can be due to high levels of iron in the water and can also cause staining and clogging of plumbing piping. Extremely hard water may shorten the life of plumbing and lessen the effectiveness of certain cleaning agents. When hard water is heated, it forms scale in pipes. In addition to narrowing and potentially clogging the pipes, scale prevents efficient heat transfer, so a water heater with scale will have to use a lot of energy to give you hot water. Soap is less effective in hard water. Langille's installed this Reverse Osmosis system directly below the kitchen: delicious water, no bottles & more cupboard space! Whether you need a Provectr system, water softener or iron filter, we will customize the system to provide safe, quality water for you and your family. Many wells, ponds and other untreated water sources may contain unwanted or harmful organisms. A supply tested drinkable, may become contaminated from underground seepage, surface water or ground water fouling from a number of sources. Ultra violet systems address these concerns without having to add chemicals such as chlorine to water or changing its chemical composition. Reverse Osmosis - Stop buying bottled water! 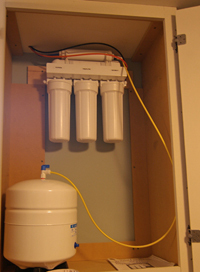 Reverse osmosis is a simple, all-in-one system that fits under your sink! Treatment of water by reverse osmosis represents a modern breakthrough in water filters. Water is processed at the molecular level, providing you and your family a reliable supply of quality drinking water.